Sirsa Shekim | Sirsa performs at “Lovesongs and Lullabies” on Fri August 11th at Fais Do Do! Sirsa performs at “Lovesongs and Lullabies” on Fri August 11th at Fais Do Do! 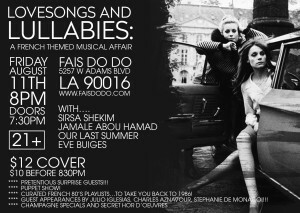 My lovely friends, we have curated a very special evening for you coming up next Friday August 11th at Fais Do Do in Los Angeles! “Lovesongs and Lullabies: A French-Themed Musical Affair” highlights performers from all over the world, who will each perform a few songs in French this show! We have a special Parisian chef coming in for the evening, a host, a puppet performance, curated playlists and so much more! All the details can be found at www.facebook.com/sirsashekimmusic under EVENTS. Sirsa proudly signs to Laurel Canon Music Licensing Full Length “Shot of Your Love” album coming soon!